SALT LAKE CITY (AP) — Utah lawmakers are considering a bill to designate the Gila monster as the state reptile. Rain from a Southern California storm caused the partial collapse of a roof at a child care center but no youngsters were hurt. KSWB-TV reports that the collapse happened Thursday afternoon at the Homeroom Hourly Child Care center in the San Diego suburb of Carlsbad. LAWRENCE, Kan. (AP) — The owner of a Lawrence pet store says an allegedly stolen lizard was anonymously returned a day after the store posted security footage of the theft on social media. DAVIE, Fla. (AP) — A Florida family is terrified of a huge Monitor lizard that has taken up residence in their back yard. The lizard is about 7 feet long (2 meters) and weighs about 150 pounds. Homeowner Zachary Lieberman tells the Sun Sentinel that the lizard was at his back patio door "scratching to get inside the house" on Sunday night. AUSTIN, Texas (AP) — The Texas comptroller's office is seeking federal approval to reform a troubled state program designed to protect a rare lizard species in the petroleum-rich Permian Basin. WILMINGTON, Mass. (AP) — A 3 ½-foot lizard is on the loose in Massachusetts, and its owner warns that it could bite. Liz Rose tells The Sun of Lowell that her Argentine black and white tegu lizard named Tiggs escaped its outdoor enclosure at her Wilmington home last week. She has been roaming the woods looking for the 4-year-old lizard, has distributed fliers and posted images on social media. SOUTH BERWICK, Maine (AP) — Police in Maine are searching for the owner of a large lizard that got loose. ROSWELL, N.M. (AP) — A little lizard is the center of controversy again, with a Chaves County administrator vowing to work if need be to keep lands in the county available for business use. "The lizard is back on our radar," said Chaves County Manager Stanton Riggs at the June 25 Board of Commissioners meeting. DEERFIELD BEACH, Fla. (AP) — South Florida's not quite Jurassic Park, but it's getting close. OLYMPIA, Wash. (AP) — The owners of an Oregon-based private wildlife center are petitioning to get their exotic animals back after Olympia animal control officers seized them a few weeks ago. OLYMPIA, Wash. (AP) — Sloths and other exotic animals have been confiscated from a home in Olympia. KIRO-TV reports that South American tree sloths, an Asian monitor lizard and other reptiles and insects were taken on Saturday. The TV station reports that the owners are licensed as a sloth rescue in Oregon, but could not produce any paperwork showing the animals could be legally owned in Washington state. LOS ANGELES (AP) — A Southern California man who smuggled five monitor lizards into the U.S. — two of which died — will spend six months under house arrest. City News Service says Gayle Simpson was sentenced Thursday in Los Angeles federal court. The 34-year-old Inglewood resident pleaded guilty in September to smuggling monitor lizards that were shipped from the Philippines. SAN DIEGO (AP) — Residents near San Diego are warned to watch out for a four-legged fugitive: a 5 ½-foot monitor lizard that wriggled out of its cage. Mike Estevez tells KGTV that a 35-pound reptile named Bubbles was last seen on Sunday at his store, Mike's Pets in Spring Valley. Estevez says the carnivorous critter probably managed to escape through a tiny crevice at the bottom of a cage. WESTFIELD, Vt. (AP) — A Vermont man is facing fish and wildlife violations for illegally bringing two lizards into the state, both of which can grow very large. RIVERSIDE, Calif. (AP) — A lizard that can grow to be 8 feet long has been found in Southern California, thousands of miles from its native land, and authorities think it's a pet gone astray. The 4-foot-long crocodile monitor was spotted sunning itself on top of a hedge Wednesday afternoon in the backyard of a Riverside home. The crocodile monitor is a relative of the famous Komodo dragon. It's native to Papua New Guinea and Indonesia — not California — but it is legal to own them in the state. HOLYOKE, Mass. (AP) — Massachusetts Environmental Police say an undercover sting operation has nabbed a person who tried to sell an indigenous lizard on social media. BEATRICE, Neb. (AP) — Most people would probably prefer not to have a house full of roaches, rats, worms and beetles, but Anthony Ward isn't like most people. To Ward, they're not vermin, they're a business model. U.S. Secretary of Education Betsy DeVos petted a lizard, read a Dr. Seuss book, heard tiny violins, learned computer code, and received protests as well as a bouquet of flowers. The Nebraska portion of her six-state “Rethink School” tour proved to be a tightly scripted event, with the secretary listening and observing at four schools and making no major policy announcements. LAKESIDE, Va. (AP) — Authorities have captured a 4-foot-long (1.2-meter) lizard that was wandering around a Virginia neighborhood. News outlets report an officer captured the monitor lizard Saturday in Lakeside. Henrico Animal Protection Police Lt. Shawn Sears says the lizard was captured after authorities received a call. Authorities say the lizard is at a facility that can accommodate its unique needs. LEWISTOWN, Ill. (AP) — Dickson Mounds Museum will feature "Snakes, Lizards and More" for its Kids' Day presentation on Sunday. The event will be from noon to 4 p.m. to celebrate World Snake Day. PORTLAND, Maine (AP) — Police in the Maine city of Portland have captured a large lizard that's been on the loose in a residential neighborhood. Residents of a Deering home spotted the lizard in their backyard Thursday. Police say the lizard , an Argentina black and white tegu, was living under a shed in an old groundhog burrow. The annual “Rockin’ for the Reptiles” fundraiser for the Midwest Museum of Natural History drew many families on a sunny Saturday afternoon in downtown Sycamore. Ask Dr. Universe: How do animals get to islands? How do animals get to islands? My friend Jonah Piovia-Scott is a scientist at Washington State University. He studies how different living things interact with each other, especially in island habitats. He is really curious about predatory lizards that live on a chain of islands called the Bahamas. PROVIDENCE, R.I. (AP) — A Komodo dragon, the world's largest lizard, is now living at Roger Williams Park Zoo. The zoo in Providence unveiled the young female Komodo dragon to the public on Friday. Zoo officials say this is the first Komodo dragon to live at any zoo in the New England area. It came from a zoo in West Virginia and will be 4 years old in August. JAKARTA, Indonesia (AP) — Indonesian authorities have arrested a Japanese man who conservationists say is a major player in the illegal wildlife trade for allegedly attempting to smuggle more than 250 reptiles out of the country. The head of law enforcement at Jakarta's international airport, Ridwan Alaydrus, said Thursday that Katsuhide Naito was arrested after customs officers found 181 lizards, 65 snakes and seven turtles in his luggage. MIAMI (AP) — What did a South Florida woman do when she lifted the lid on her toilet and found an iguana inside? She closed it again and called 911. Lt. Scott Mullin of Miami-Dade Fire Rescue's Venom One unit tells the Miami Herald (http://hrld.us/2rezbhp ) it's the first time he's found an iguana in a toilet. Mullin says when the call came in Tuesday night, he asked the dispatcher to make sure it was an iguana and not a snake. TAUNTON, Mass. (AP) — Police in Massachusetts say a bearded dragon lizard was turned over to animal control after a woman suspected of drunken driving revealed she had the animal stuffed in her bra. 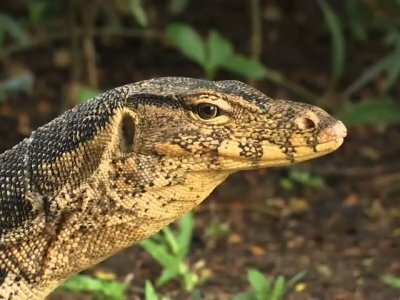 JAKARTA, Indonesia (AP) — A Komodo dragon has bitten an overly inquisitive tourist in Indonesia who ignored warnings about getting too close to the enormous reptile while it was eating, a national park official said. The tourist from Singapore was bitten on his leg Wednesday morning while taking pictures of the Komodo dragon, the world's largest lizard, said the chief of the Komodo National Park, Sudiyono. MOBILE, Ala. (AP) — As a fire engulfed her apartment building, a woman leaped from a second-floor balcony and rescued her two dogs. AL.com reports (http://bit.ly/2pgN3pU) that a fire broke out at an apartment complex Sunday afternoon. SUNNY ISLES BEACH, Fla. (AP) — Perched in trees and scampering down sidewalks, green iguanas have become so common across South Florida that many see them not as exotic invaders, but as reptilian squirrels. Native to Central and South America, green iguanas that escaped or were dumped as pets have been breeding in the Miami suburbs and the Keys for at least a decade without making headlines like other voracious invasive reptiles such as Burmese pythons or black-and-white tegu lizards. LEWISTON, Maine (AP) — A woman accused of having 64 pets including snakes and lizards inside her apartment in Maine denies they were neglected. Officials say one pet was dead and others needed medical attention when they arrived. But Samantha Bell pleaded not guilty to five counts of animal cruelty Wednesday. The pets included cats, dogs, chinchillas, gerbils and hamsters. LINCOLN, Neb. (AP) — Nebraskans are being encouraged to pick their favorite turtle, snake or lizard to become the first state reptile. The Nebraska Game and Parks Commission is holding an online vote to determine the favorite reptile out of six species that are native to the state. Nearly 40 years after Egg Mountain revealed fossils that would forever change the way people thought about dinosaurs, the site located on Montana's Rocky Mountain Front continues to yield new wonders. Komodo dragons are the largest lizards in the world. They can grow up to six feet long and weigh more than 150 pounds. The large lizards, which live on five islands in Indonesia, have some unusual behaviors. If threatened, a Komodo will throw up — you know, barf — to make themselves lighter so they can escape more easily. Gross, huh? MICHIGAN CITY — The Washington Park Zoo needs more seasonal workers and volunteers in anticipation of its opening April 1. “We are taking applications right now,” said Zoo Director Jamie Huss.The zoo also is hiring a temporary (seasonal) zoo keeper. Zoo keepers at this facility work with a variety of species, diet prep, education and more.This position is a great way to gain experience into the animal care field and it may be the only place where workers go from age 18 to 99. MICHIGAN CITY— Washington Park Zoo will be adding new animals and a new featured exhibit to its facilities this year. The Michigan City Park Board approved the additions at their Feb. 6 meeting. The first animal additions will be two new goats to the zoo’s goat herd. The zoo is looking at a couple of larger breeds, the boar goat and the Nubian goat. Both species of goat are currently not displayed in the petting zoo. HONOLULU (AP) — Two men working on a roof on Oahu have captured a member of an illegal, invasive species after seeing the giant green lizard munching on a dead bird. KHON-TV reports (http://bit.ly/2hcygbh ) that brothers Nick and Ryan Lundquist were working in Kailua on Wednesday when they spotted the animal, identified by the state Department of Agriculture as a Cuban Knight anole. The lizard, which can be found climbing trees, is a threat to native birds and eggs. It also carries salmonella.